I just finished reading Historian Jill Lepore's thoughtful piece on technological determinism from the May 12 issue of The New Yorker. Technological determinism, for the uninitiated, is a belief that technology is a major historical actor. Lepore, however, brings a much more focused meaning to the term, stating that "in its purest form technological determinism looks a lot like the nineteenth century idea of progress and holds that machines are the most important factors in human history, that they follow a fixed path through set stages, and they bring about social, political, cultural, and economic change." Lepore's piece is ostensibly a review of two books: Maury Klein's The Power Makers: Steam, Electricity, and the Men Who Invented Modern America, and Robert Friedel's A Culture of Improvement: Technology and the Western Millenium. However, these books are only background for Lepore's meditations on the idea of technological agency in the United States. Near the end of the piece, she identifies what she sees as the most pressing problem with Klein's book: a lack of historical context. Lepore's piece, far from being a screed, thus becomes a type of corrective that gives us an idea as to how to counter technological determinism. This, and other correctives are well known. It is thus interesting how Lepore does not mention other histories of technology that do fairly well in avoiding issues of technological determinism (the work of William Cronon, Thomas P. Hughes, Merritt Roe Smith, and Wolfgang Schivelbusch immedately come to mind). And because she is writing this piece from the point of view of an American historian, her invocations of Leo Marx and Lewis Mumford are totally apposite. Measuring an invention only by its eventual effect obscures other possible outcomes and, finally, distorts the historical record. That day in 1977 when my brother got a TRS-80, we thought it was some cross between a television and my sister's cassette tape recorder; we didn't shout, "Wow, the information age has arrived!" 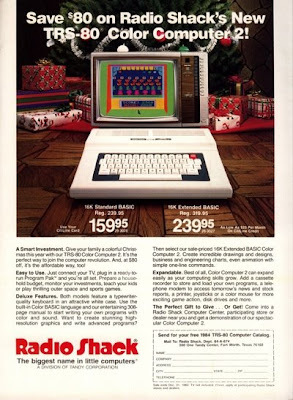 Even the Tandy Corporation would have been hard pressed to see that coming. It looks different now, of course; the TRS-80 wasn't a dead end; it was a big deal. The challenge, in this case, would be to write a history that can explain both what we though then and what we know now. A method that ignores our it-looks-like-a-television response will make it seem as if the information age were inevitable, headlong, and unstoppable (which might even be true) but will fail to prove it. These are strong, quiet words that Lepore brings in defense of Friedel's book. It's the first time since I can remember that I've ever seen historiographical and methodological issues in a mainstream publication. But it does speak to an important, if not the solitary, charge in the writing of history. Lepore's statement is near-Benjaminian in its tandem evocation of past and present at the service of writing history. But for those of us who struggle with making the writing of history more relevant, no words sound sweeter. To be sure, I always understand technological constructions to be inseparable from social constructions (the telegraph was nothing until it finally was embraced as a communications medium, the Internet was a tool for geeks for years and could have been adopted for mass communications a decade earlier). On the other hand, we better be careful about what we thought then. For unlike Lepore, when I first saw microcomputers (this also goes for the Web), I had a good inkling of just how transformative they might be. I had no particular idea what they would do to us, but I did know it would be radical and would uproot everything. Not trying to sound smarter than she here (I was 10 in 1977), but the condition she describes in that one instance, at least, isn't so cut and dried. Agreed ... I think that a good example that runs counter to Lepore's TRS-80 paradigm is, of course, the airplane. However, I marvel at the fact that she kinda gives a good inkling as to how history writing can be brought to the forefront. And she does bring it to the forefront. In other words, although her views may be a little "cut and dried" as you suggest, at least I did not read this article in an issue of Technology and Culture or Isis.